Unlike many alternative websites, WrestlingMart offers free shipping on nearly all domestic orders (within the United States) placed on our website, with only the exception of Mat Cleaning Products. Just because shipping is free doesn't mean it should take a long time and WrestlingMart understands that getting your items quickly is important to you, so we make every effort to process your order quickly. If you need your item by a specific date, please give us a call at 1.888.887.8893. We are dedicated to getting your wrestling gear when you need it! We are proud to provide our online customers with FREE Standard Shipping for all online orders, with the exception of Mat Cleaning products. PO Boxes, Hawaii and Alaska, and US Territories will ship standard through the US Postal Service, so please allow up to an additional 2 weeks of transit time. Can I go to your Showroom in Southern California to pick up my order? We always love to have Wrestling enthusiasts visit the world’s largest wrestling showroom located in Irvine, California to just try on some new gear, to share a great wrestling story, or to pick up their order. We encourage everyone to leave a note in our order comments section. What shipping providers does WrestlingMart.com use? WrestlingMart partners with FedEx and USPS. Does WrestlingMart.com offer deliveries on the weekend? To provide our customers with the best service possible, WrestlingMart, partnering with USPS and FedEx, delivers packages on Saturdays to home addresses only. We do not deliver packages on the weekend to PO Boxes or Businesses. Please note that we only ship products out the door Monday thru Friday 2pm (Pacific Time) so get your orders in soon. All orders processed before Friday 2pm (Pacific Time) will be in the shipping carrier’s good hands. Where does wrestling gear and apparel I order through WrestlingMart.com ship from? 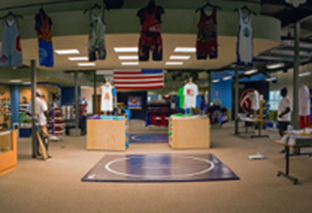 Most items will ship direct from our showroom, the world’s largest wrestling showroom based in Southern California, if the product is in our inventory. Under certain circumstances, we may also dropship direct from one of our many suppliers/manufactures to ensure you get your specific wrestling gear on time. If I have not received my online order, how can I track it? Once you place your order online, WrestlingMart will send you confirmation that the order has been placed. Once the shipment is sent, we will send you a shipment confirmation with tracking information for your reference. We always recommend that our customers check their spam folder or junk mail folder in case it gets blocked for some reason. Please make sure that you make WrestlingMart.com an accepted email address. You can always call us at 1.888.887.8893 if you lost your original email. Can I ship to a Military address? Yes, you can ship to any Military address within the continental United States. Please allow 2 to 4 weeks for delivery. Line 1: Full name and/or job title. Line 2: The delivery line (the second line from the bottom in the address) must show the word “UNIT”, “CMR” or “PSC” and number; and box number assigned, when applicable. Line 3: The bottom line must contain the APO or FPO (“city”) designation and the appropriate two-letter AA, AE, or AP (“state”) abbreviation followed by the ZIP Code or ZIP+4 Code. Can I ship internationally? No, currently WrestlingMart does not ship outside of the United States. It is important to note that some of our manufacturers do NOT allow us to ship outside the United States due to their relations with their regional counterparts in other countries around the world. Please call to talk to one of our customer service experts for more details at 1.888.887.8893. All shipping and related fees will be reflected during checkout.